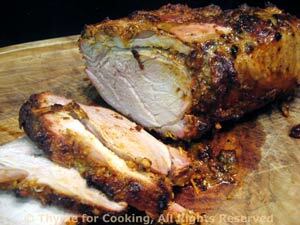 Thyme for Cooking easy summer recipes: Pork Tenderloin with Mustard Seeds. This is an easy dinner, everything cooking on the barbecue grill for about 30 minutes and only requiring a bit of attention. Round it out with some sliced, juicy tomatoes. Cut the vegetables into pieces about 1/2 inch by 1 1/2 inch - or whatever. Divide evenly between the 2 plates keeping in the center of foil. 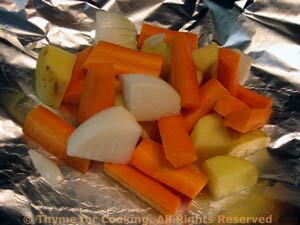 Kind of pat the foil down so it takes the shape of the plate - otherwise the chicken stock runs everywhere. Put on barbecue - indirect heat (not over the coals), cover and cook for 30 minutes. Or put in 400F oven for 40 minutes. Check to make certain everything is done. 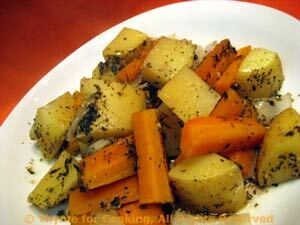 Remove vegetables from packets and serve. Note: This is 'cooking by sound': When the packets start sizzling, they are cooking. When they stop, they are done.... But if they don't stop, check them after 25 minutes. Just open one part way and poke a knife into the potatoes. They will continue to cook, after removed from heat, if left wrapped.